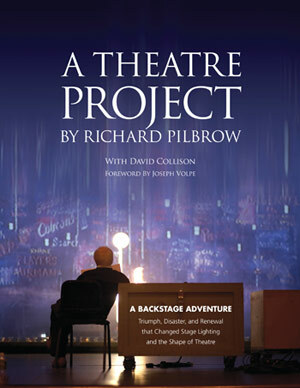 Introducing Richard Pilbrow’s new memoir, A Theatre Project, now available from PLASA Media. "The author of the book happens to be one of my favorite folks of all time. I can barely imagine any time more enjoyably spent than in reading what follows in the book . . . He is the MASTER . . . and, thank heaven, wonderfully silly with it. My life has benefitted immeasurably from his being embroiled in it, as my closest friend and colleague." "A Theatre Project is also a window into one of the secrets of Richard Pilbrow’s success and that is collaboration. No theatrical endeavor, whether it is a performance, a theatre, or performing arts center can be realized without collaboration . . . It is a true honor to call him a colleague and I must admit that his generosity and perseverance inspire. No one embodies the best of this crazy world of the theatre more than Richard Pilbrow." "Richard Pilbrow with colleague David Collison, has written the ultimate book on the creative team side of theatre production. For the theatre aficionado, it is the perfect Christmas present." "Huge and superbly illustrated . . . It's an absolute joy to read . . .a history of theatre from an entirely new and fresh perspective"
"Fascinating theatrical anecdotes . . . a great read . . . extremely informative . . and it's also inspirational"
"Fascinating story. A complete and most readable record . . . of the most complete non-acting theatre life I know of." You might also enjoy The Sound of Theatre by David Collison! "Endlessly interesting. The whole book is such an informative and generous record of its subject." Check out A Theatre Project – the App! Richard awarded the Knight of Illumination "Lifetime Achievement Award" at the 4th annual Knight of Illumination Awards during the PLASA show in London. CLICK HERE for the first half hour of Richard�s conversation with costume and set designer Tony Walton at The Drama Bookshop on February 25. Join us at future events to get in on the conversation! VIDEO: Richard discusses "A Theatre Project" during a book signing at PLASA's New York offices, August 2011.